Detroit's Dorais Velodrome bicycle racing track, like much of the city, laid abandoned for decades. 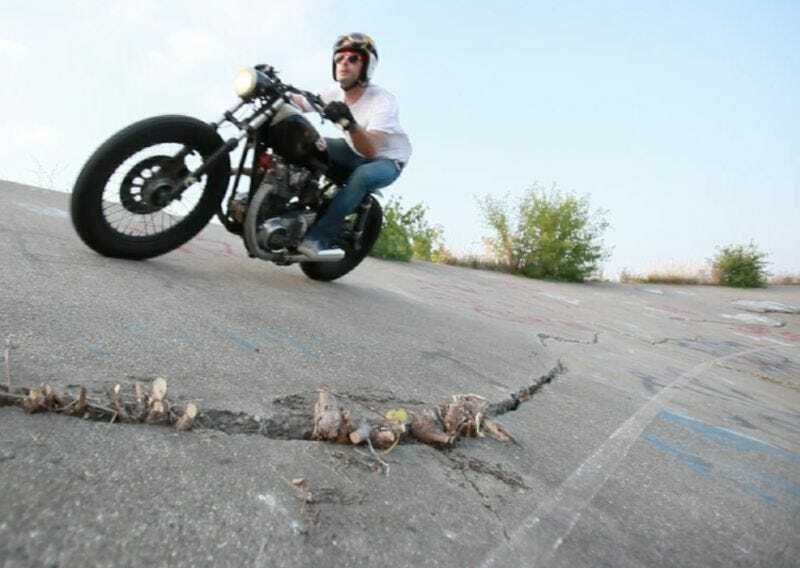 Recently, a group of volunteers reclaimed it from the overgrowth and created the perfect place to race old motorcycles. If you're strolling along in Detroit's Dorais Park without walking over a certain hill, you'd never know there was a velodrome there. The 'drome was built in 1969 and held regular professional bicycle races, but fell into disrepair in the 80's and the city stopped maintaining it. For years it's been sitting largely unused in a rough neighborhood with the steeply banked cement cracking and brush growing through the track. Moved by the possibilities, a group of volunteers calling themselves "Detroit Mower Gang" brought it back from the brink this summer. They descended on the track with mowers and chainsaws, clearing away the overgrowth, removing garbage and tires, and generally sprucing it up. While it's not fit for high-speed bicycle racing anymore because of some pretty gnarly crevices, it's the perfect spot for some quasi-legal motorcycle racing. Recently, a couple of locals hit the track with their cafe bikes and had some fun. This kind of thing's been going on for years, but now you can actually get up some speed. The work on cleaning up the infield is ongoing, but now that the velodrome is somewhat usable again, it's getting a lot of attention. Rumor has it there are designs on a mountain biking race in the near future. Stay high on the North side bank, there's a pretty good ravine over there.